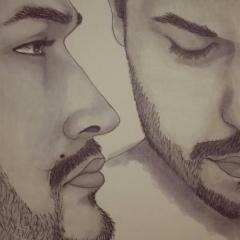 Want to see my drawings, my drawings I drew? By MoreIntensity, December 20, 2017 in Post Your Art! Hi, I'm really inspired by the many talented individuals of this community. I'm going to start sharing my work. Just drawings I've done for fun, or maybe local contests...actually only one contest. Hopefully I can figure out how to upload the files. I don't know how to upload attachments. Anyone who can help? So, I have a link to a drawing I uploaded to my newly created deviant art page. This drawing was for a submissio to the Graphic novel contest for san jose public library in California. I used it for the cover, with some lettering for title. I used a pencil, just a yellow number 2, and then a few gray tone Copic markers to provide contour and tone. No color allowed. I think I used a Copic liner pen for the inking. A bit of white paint for highlights in eye. You can probably see my mistake, whereI misplaced/forgot to place my mole on correct side of face. Using my face was the easiestway to get a cover illustration done, because the interior pages were so time consuming, and it was a last minute project. I'm very much into procrastinating. Hi. 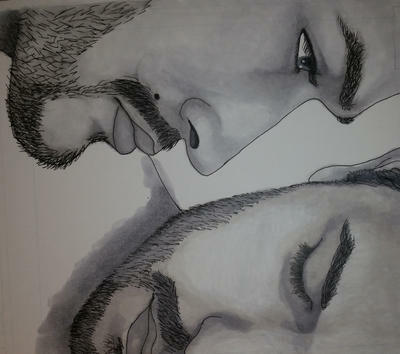 I wanted to say that I will be scanning some more of my drawings and what not pretty soon. I just wanted you all to know that my ugly face isn't the only thing I have to show off. ...heh heh heh. I will get the short story I did for the 2012 SJPL graphic novel contest up on this post. I actually placed 3rd for that one, and that was literally done the night before. I worked on that thing until about 5 in the morning, then had to get to work the same morning at my crappy job at Safeway. Ugh. But, honestly, the endorphins or whatever that were released from the creative process kept me going all day! So, I think by Saturday January 30, I should have quite a few more pages up. Please, feel free to leave comments. Even if you want to just troll. I don't mind. I know my own personal worth, I'm on my own journey. Thanks. Hi. 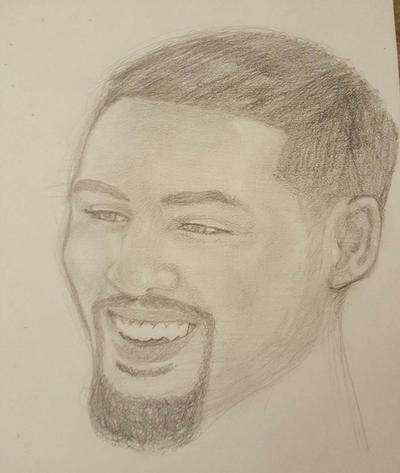 I found a drawing of Klay Thompson I did about a year ago. Photo was online, and I was feeling like "i need to force myself to draw" at that point in time. Kinda like how I feel now. This was just pencil on some sketch pad, maybe regular copy paper? Just something quick, for exercise. You have a great start in terms of anatomical structure and shading. Keep practicing, the more you do, the better you become! May I recommend Stephen Peck's Atlas of Anatomy? Very good book indeed, especially for references. You're pretty good, MoreIntensity. How long have you been drawing btw?